WRIGHT-PATTERSON AIR FORCE BASE, Ohio (AFPN) -- In a picture-perfect touchdown, the Global Hawk unmanned aerial vehicle landed at Edwards Air Force Base, Calif., Oct. 20 after completing a 24.8-hour mission that included several firsts. Those firsts were: first mission over water; first flight beyond the continental United States, to Alaska; and the first of several extended-range sorties commissioned by U.S. Joint Forces Command in a continuing military utility assessment. The mission demonstrated Global Hawk's ability to linger long over water when supporting multiple theaters of operation, said Lt. Col. John Wellman, chief, Joint Reconnaissance Operations, U.S. Joint Forces Command. "We focused on effectively locating mobile targets," Wellman said, "and baseline range imaging for Naval Air Station Fallon Range near Reno, Nev., and Cope Thunder Ranges in Alaska." The 33rd overall flight for the Global Hawk flight test program, this latest mission was the 22nd sortie for Air Vehicle No. 1. Following takeoff at 12:07 p.m. Oct. 19, Global Hawk reached 66,000 feet, collecting 193 imagery scenes, including 169 synthetic aperture radar spot images and 24 synthetic aperture radar wide-area search images. "While in Alaskan airspace, Global Hawk disseminated 148 SAR spot and 12 SAR WAS imagery scenes," noted Maj. Victor Martinez, Global Hawk System Test and Demo Team lead. "As it flew over NAS Fallon, it disseminated 96 SAR spot and 3 SAR WAS imagery scenes. And while there were three Integrated Sensor Suite restarts after initial flight boot-up, the ISS set a new record of 15.5 hours of continuous operation. With this mission, the Global Hawk flight test program has reached 361.5 hours, with 187.6 hours focused on 10 Development and Evaluation sorties that began in June. "Preliminary flight test results and information from the mission debrief indicate that all Global Hawk engineering test objectives were met except for one series, because we shortened the mission slightly," Martinez said. "Now that Global Hawk has flown to Alaska and back, the U.S. Joint Forces Command and the Air Force Operational Test and Evaluation Center will evaluate exercise (results)." 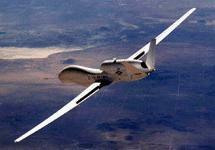 The major added that Global Hawk posted additional accomplishments during this mission. "For the first time, we performed a common data link engineering test at Fallon Range where Global Hawk images were transmitted in near-real-time to a multi-service imagery exploitation system, showing the unmanned aerial vehicle's capability for direct downlink to users," he said. 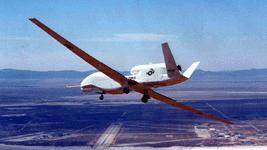 "We also demonstrated the UAV's navigation and operations capabilities at latitudes above 65 degrees north." Global Hawk is being developed by the Air Force as a long-endurance, high-altitude UAV intended for multiple battlefield applications. It will give military commanders the ability to "see" movements of enemy assets from great distances with startling clarity and near-real-time accuracy. 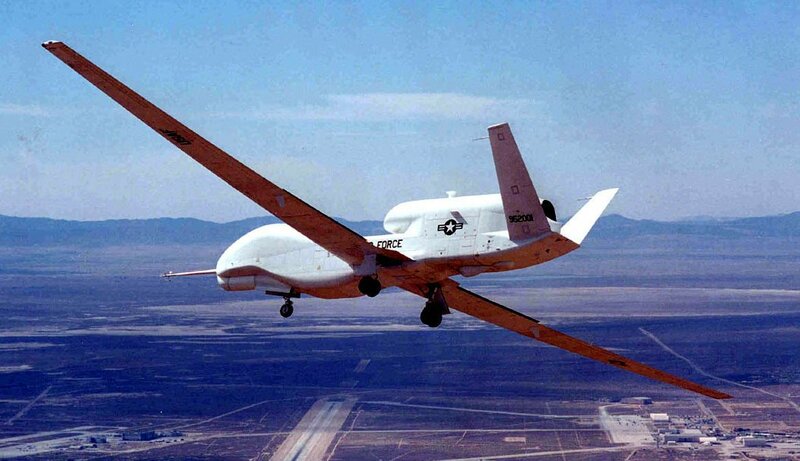 Capable of surveying an area the size of the state of Illinois, or 40,000 square miles, in just 24 hours, Global Hawk can range as far as 13,500 nautical miles at altitudes approaching 65,000 feet.